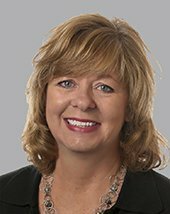 Susan Lennon rejoined the Commercial Kentucky team as the Business Operations Manager. Her twenty-plus years of service have included serving as the local Real Estate Research Analyst, Regional Research Services Manager and Director of Marketing for Commercial Kentucky and Cushman & Wakefield. She is now responsible for the business’ financials, human resources, vendor negotiations, and the day-to-day physical operations of the Commercial Kentucky office. She also serves as the liaison between Commercial Kentucky, Inc. and Cushman & Wakefield. Mrs. Lennon is a graduate of the University of Kentucky with a B.B.A. in Marketing and holds a M.B.A. from Bellarmine University.